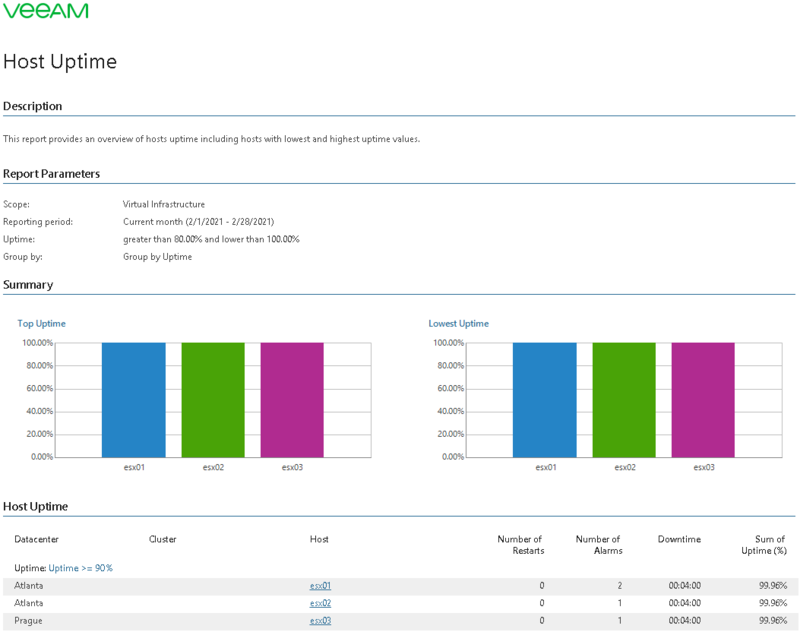 This report analyzes host uptime statistics to track host availability. The Top Uptime and Lowest Uptime charts display top 5 hosts in terms of the highest and the lowest uptime values. The Host Uptime table provides the list of hosts whose uptime values are lower and greater than the specified thresholds. Click a host in the Host column table to drill down to details on alarms triggered by Veeam ONE Monitor and host restarts. This report helps you discover the most and the least utilized hosts in the environment to restore their efficiency and improve target ROI. Business View objects: defines Business View groups to analyze in the report. The parameter options are limited to objects of the “Host” type. Group by: defines how data will be grouped in the report output (by Uptime, Datacenter or Cluster).